Dušan Otašević graduated from the Academy of Fine Arts, Belgrade in 1966. Influenced by the Pop Art, he produces sculptural or painterly objects dealing with everyday situations refracted through the optics of omnipresent irony, based on false sentimentality, the dominance of kitsch, political manipulations and consumer fevers. 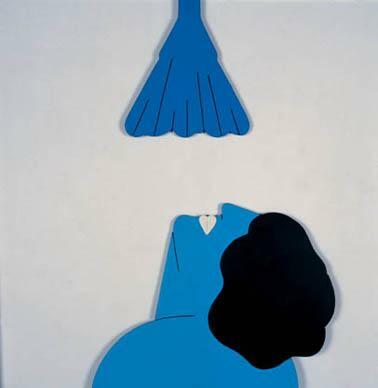 Venus is Rinsing the Detergent Foam, 1970, colored plywood, 100x100cm.